16 119 125 Christopher C George Private B 139 Pa Vol Aug 4 1862 June 9 1865 2 10 25 16 Portage Cambria Co Pa Wounded and crippled in foot. Organized at Pittsburg September 1, 1862. Moved to Washington, D.C., September 1-3. Attached to 2nd Brigade, 1st Division, 4th Army Corps, Army of the Potomac, to September, 1862. 2nd Brigade, 3rd Division, 6th Army Corps, Army of the Potomac, to October, 1862. 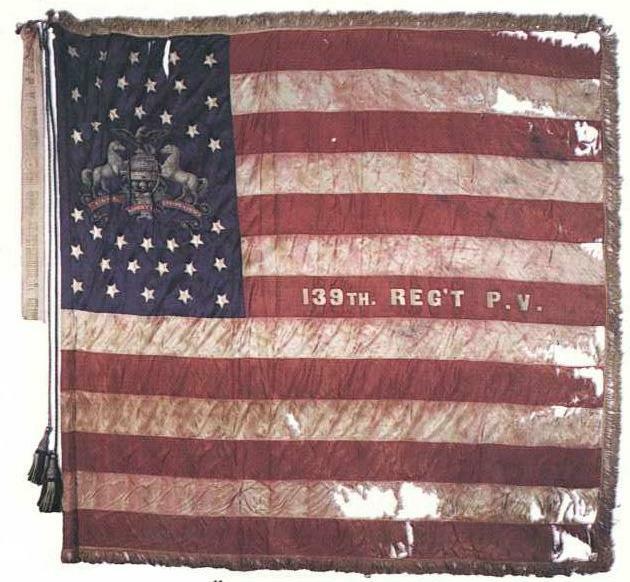 3rd Brigade, 3rd Division, 6th Army Corps, to January, 1864. Wheaton's Brigade, Dept. of West Virginia, to March, 1864. 1st Brigade, 2nd Division, 6th Army Corps, Army of the Potomac, and Army of the Shenandoah to June, 1865. SERVICE.--Bury dead at Bull Run, Va., September 4-7, 1862. Maryland Campaign September 7-24. Battle of Antietam September 16-17 (Reserve). At Downsville September 23-October 20. Movement to Stafford Court House October 20-November 18, and to Belle Plains December 5. Battle of Fredericksburg, Va., December 12-15. Burnside's 2nd Campaign, "Mud March," January 20-24, 1863. At Falmouth until April. Chancellorsville Campaign April 27-May 6. Operations at Franklin's Crossing April 29-May 2. Maryes Heights, Fredericksburg, May 3. Salem Heights May 3-4. Banks' Ford May 4. Gettysburg (Pa.) Campaign June 13-July 24. Battle of Gettysburg July 2-4. Pursuit of Lee July 5-24. Duty on line of the Rappahannock and Rapidan until October. Bristoe Campaign October 9-22. Advance to line of the Rappahannock November 7-8. Rappahannock Station November 7. Mine Run Campaign November 26-December 2. At Harper's Ferry until March, 1864. Rapidan Campaign May 4-June 12. Battles of the Wilderness May 5-7; Spottsylvania May 8-21. Assault on the Salient May 12. North Anna River May 23-26. On line of the Pamunkey May 26-28. Totopotomoy May 28-31. Cold Harbor June 1-12. Before Petersburg June 17-18. Jerusalem Plank Road, Weldon Railroad, June 22-23. Siege of Petersburg to July 9. Moved to Washington, D.C., July 9-11. Repulse of Early's attack on Washington July 11-12. Pursuit to Snicker's Gap July 14-24. Sheridan's Shenandoah Valley Campaign August to December. Near Strasburg August 13. Near Charlestown August 21-22. Demonstration on Gilbert's Ford, Opequan, September 13. Battle of Opequan, Winchester, September 19. Strasburg September 21. Fisher's Hill September 22. Battle of Cedar Creek October 19. Duty in the Shenandoah Valley until December. Moved to Petersburg, Va., December 9-12. Siege of Petersburg December, 1864, to April, 1865. Dabney's Mills, Hatcher's Run, February 5-7, 1865. Fort Fisher, Petersburg, March 25. Appomattox Campaign March 28-April 9. Assault on and fall of Petersburg April 2. Pursuit of Lee April 3-9. Sailor's Creek April 6. Appomattox Court House April 9. Surrender of Lee and his army. March to Danville April 23-27, and duty there until May 23. March to Richmond, Va., thence to Washington, D.C., May 23-June 3. Corps Review June 8. Mustered out June 21, 1865. Regiment lost during service 10 Officers and 135 Enlisted men killed and mortally wounded and 5 Officers and 86 Enlisted men by disease. Total 236. CAN READ CAN WRITE SPEAK ENG? Birthdates of living people have been withheld to protect identities.